US Special Envoy to the Middle East Senator George Mitchell is to present a package of economic incentives to the President Abbas this week in an effort to kick-start the stalled peace process. Negotiations broke down last year after Israel launched Operation Cast Lead in response to an escalation of rocket fire from Hamas following the end of their truce. After his election to office, US President Barack Obama had insisted that Israel halt all settlement activity in Judea, Samaria and east Jerusalem in accordance with the 'Roadmap to Peace' document. This call was repeated by leaders from around the world, including the European Union, France and Britain. Israeli Prime Minister Binyamin Netanyahu eventually agreed to a temporary freeze. Javier Solana, then High Representative for the European Common, Foreign and Security Policy, had also insisted that a Palestinian state should be established within a set time period should the parties involved be unwilling to reach an agreement. Two years was given as the timeframe by which this was to be achieved, and once again, this objective was adopted by both President Obama and Palestinian Authority Prime Minister Salem Fayyad. The idea of unilaterally declaring a Palestinian state was given a boost late last year when the government of Sweden, holding the presidency of the European Union, put forward a motion that would have recognized Jerusalem as the capital of a future Palestinian state. And now the Spanish government, the current holder of the EU presidency, is seeking to bring about the establishment of a Palestinian state before the end of this year. So it seems that the Palestinian Authority now feels it has little or no reason to negotiate with Israel, and some political analysts believe that President Abbas has deliberately hardened his stance in order to undermine the talks and force the international community to recognize a Palestinian declaration of independence. His demand that Israel permanently halt all settlement activity in Judea, Samaria and east Jerusalem, even before the talks recommence, is purposely designed to scupper the chances of a negotiated agreement and force the international community to act against Israel. If that happened, the Palestinians could take east Jerusalem and the Temple Mount without having to negotiate with Israel, and Israel would get the blame for refusing to accede to the initial Palestinian demands. Quote: "Politically, many in the Palestinian leadership assess that adopting a unilateral "Kosovo strategy" and seeking international legitimacy to impose the 1967 borders on Israel is their best option, which, in their view, would automatically solve the issues of Jewish settlements and the status of Jerusalem without having to negotiate with Israel, while leaving the refugee issue to be decided according to the "agreed-upon solution" specified in the Arab peace initiative. And now Senator Mitchell is on his way to Israel and the Palestinian territories, to offer an economic incentive package to President Abbas, with the hope of restarting the negotiations. His package may also include certain 'guarantees' concerning the establishment of a Palestinian state, which have not been spelled out but are likely to include a deadline for the establishment of a state and assurances on east Jerusalem and the Temple Mount. Quote: "Palestinian sources added, "The Americans are looking to provide our leaders with a ladder to get down from the tree they are in, and want us to return to talks, especially in light of the fact that Israel has declared a settlement freeze, and especially in light of the fact that negotiations over the basic principles of the peace process are already being held between us and the Americans and between the Americans and the Israelis." The sources estimated that if an economic conference for the Palestinians is announced, and if the Palestinians receive a guarantee from the Americans as to the details of a permanent settlement, they may bend on their stance and return to the negotiations table. So it seems that despite there being little movement on a peace agreement between Israel and the Arabs this year, we could still be much further on prophetically than we imagine. For the Bible indicates that it will be a leader of the revived Roman Empire - the European Union, who will strengthen an agreement between Israel and its enemies (Daniel 9:27) and who will eventually divide the Holy Land for his own benefit (Daniel 11:39). 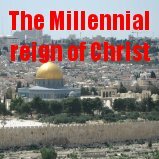 The prophecies of Zechariah 11:2, 14:2 and Revelation 11:2 seem to indicate that the area of Judea (present day southern West Bank and Jerusalem) will come under siege during the tribulation period, and that east Jerusalem will fall to the Gentiles for the final three and a half years of world history. The very fact that there has been no solution found to the Middle East conflict for the duration of Israel's existence proves to us that what the Bible says is true. For the Bible says it is the Antichrist who will bring 'peace' and divide the land of Israel between Jew and Gentile. And as he has not yet been revealed, so peace has not been found, and the events spoken of in the book of Revelation are yet to be fulfilled. But they will come to pass. The question is, are you ready? What if a Palestinian state was unilaterally declared in two years time? Or what if the Lord came before that? Would you be safe in the Ark of God's salvation? The day of salvation is drawing to a close. Just as God closed the door of the ark before the flood came, so the Bible says a day is coming when the Master of the house will shut the door of salvation for you. Don't put the matter of salvation off for another day. It may never come. The only thing we can ever be sure of is today. Trust in the Lord Jesus Christ for salvation today. He will not turn you away.